Design of the student village supports the university’s focus on health and the environment. Bastyr University, one of the country’s premier schools of naturopathic medicine, teaches healing in a sustainable way that connects people to the natural world. 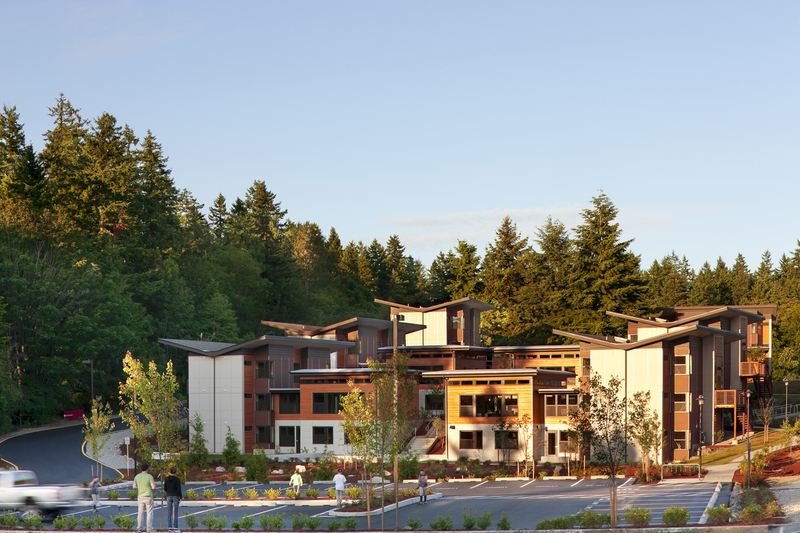 So when the decision was made in 2007 to add student housing to its campus in Kenmore’s St. Edwards Park, creating a sustainable, healing and connected environment was the primary goal. Just three years later, the U.S. Green Building Council awarded Bastyr’s student village its top honor as the LEED for Homes multifamily project of the year. The project is a story about collaboration, a focus on the end use and enthusiasm to get it perfect. Bastyr University’s student housing consists of small building clusters in a garden setting. Overhangs provide enough shade to eliminate the need for air conditioning. Bastyr moved to its campus, a former seminary complex, in 1996. The 1950s brick buildings served well for classroom space, but on-site student housing consisted of 40 cramped rooms. Within a few short years, student population swelled and outgrew existing housing. A 2003 campus master plan provided guidance for future development through key principles such as “embracing the context of Bastyr’s setting,” “creating a deeply restorative environment,” and using gardens as central unifying elements. 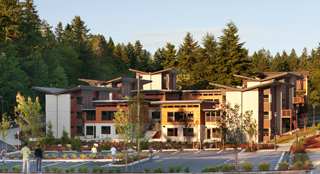 Student housing was the first priority, and in 2008 CollinsWoerman began design of the student village, originally intended to house 120 students. CollinsWoerman designed the Bastyr Center for Natural Health in Wallingford in 2006, and so it was familiar with the unique perspective Bastyr brought to the relationship of people and the built environment. The design team used a series of outreach sessions with students, staff, the university board and the Kenmore community to gather input. The responses revealed a common theme of “connection”: to the environment, health, university, and most important, fellow students. Cottages each house 12 students, all with their own bedrooms and bathrooms. Students share cooking and gathering spaces, shown here, to conserve resources. A traditional apartment-style student residence concept didn’t fit the Bastyr mission. It didn’t encourage interaction, nor did it provide “connection.” A fundamental shift that would better connect the buildings to the site and the students to each other was needed. Research showed groups of eight to 12 would provide a richer intellectual environment and create more opportunity for collaboration and resource sharing. The team proposed a series of smaller-scale cottages to accommodate small student groups with a common living area, kitchen, study and laundry, and private bedrooms and baths. Clusters of three or four cottages created a series of neighborhoods that formed a village of 11 cottages, each housing 12 students with a total bedroom count of 132 — 12 more than the initial target, for the same cost. A series of paths meandering through gardens filled with medicinal herbs and edible plants connect cottages to each other and the campus. There are no internal corridors and thus no expense in building, heating and maintaining them. Strong visual linkages reinforce the connection between students. Bastyr’s primary goal was to create a healthy, economical, durable and livable environment. Some visibly green options such as solar panels and green walls were not cost effective, while others had to be modified. For instance, the team planned to reuse rainwater within the buildings, but existing drainage patterns required all roof water and groundwater be used to replenish the wetland near the site. Site Workshop landscape architects combined open space, water management and planting into a unified whole. Native, non-invasive and drought-tolerant species were selected, and high-efficiency irrigation installed. Bastyr’s garden coordinator created “permaculture” gardens, focused on providing edible, medicinal plants for the students and community. Site runoff from parking is directed into a cleansing biofiltration swale and released slowly to the wetlands. Green roofs over the great rooms bring the gardens further into the living experience. Each occupied room has at least one operable window to provide light, air and views. Strategic overhangs provide enough shade that no air conditioning is required. A central gas boiler system supplies heat and hot water. The system uses four super-high-efficiency Noritz on-demand boilers, feeding the domestic water and hydronic in-floor heating system. 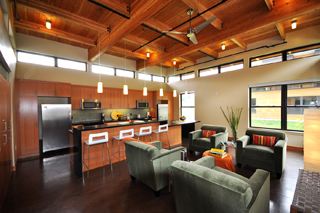 Interior finishes were selected for sustainability, durability and indoor-air quality. Real linoleum (made from linseed oil) was used in the bedrooms and baths, and stained concrete in common areas to avoid indoor-air quality hazards from trapped allergens and environmental pollutants in carpet. Wood was used extensively on the interior, especially in the great room, with a tongue-and-groove fir ceiling. Wood casework was made with Forest Stewardship Council-certified fir veneer. No-VOC paints and low-VOC adhesives and sealants were used. Durable exterior materials included fiber cement lap and panel siding, fiberglass-frame operable windows and aluminum accent trim. Shared cooking, laundry and gathering spaces more effectively combine and conserve resources. Additionally, each cottage is equipped with compost and recycling bins and no garbage disposal. LEED for Homes was a relatively new program when the project began, but its applicability to low-rise residential appeared to be the best tool for Bastyr. The project team, which included Schuchart Corp. as the contractor and O’Brien & Co. as the LEED for Homes provider and green rater, uncovered opportunities to capture points, such as bicycle storage at the front door, food production in permaculture gardens and third-party verification. Schuchart achieved points for framing efficiencies using precut lumber packages and achieving a 97 percent recycling rate. Advanced training for students, staff and the public garnered additional awareness and education points by incorporating operations and maintenance manuals, newspaper articles, websites and walkthroughs. The home size adjustment calculation, which awards points for reducing square feet per occupant, became one of the largest point sources. King County provided Bastyr University a $25,000 grant for achieving LEED gold, and an additional $5,000 for LEED platinum. Puget Sound Energy provided a grant of over $132,000 through its multifamily grants program for gas high-efficiency boilers, Energy Star appliances, compact fluorescent light fixtures, dual-flush toilets and low-flow shower heads. While many factors made this project unique, three are useful for any green building project. Focus on the end-user. Understanding Bastyr’s values and priorities — and how students would experience the residence — were the paramount driving force behind the village. The project was less about winning accolades and awards and more about delivering the living experience the university sought. Collaboration works. This project enjoyed an extraordinary level of collaboration and cooperation. The entire team — the university, architects, contractor, subcontractors, consultants — became tighter, more cooperative and collaborative as the project evolved. Occasionally, enthusiasm trumps experience. Experienced team members guided the project and educated those new to the practice of green building. The latter embraced the challenge, bringing fresh ideas, enthusiasm and approaches to the effort. This combined perspective enabled the team to achieve more together than any could have foreseen at the outset.